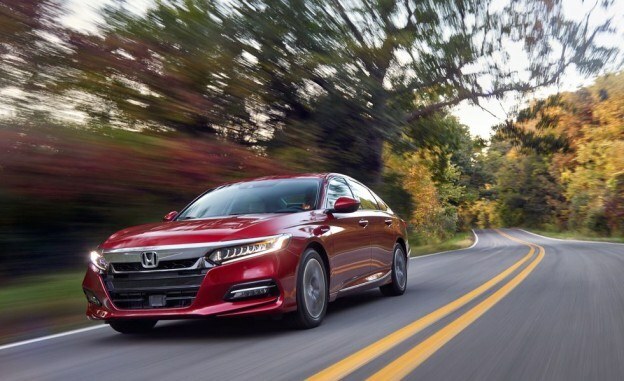 Home Awards & Accolades The Honda Accord has appeared on our 10Best Cars list a record 33 times. The Honda Accord has appeared on our 10Best Cars list a record 33 times. Such an achievement is no accident; it’s the culmination of Honda’s fastidious fine-tuning and dogged attention to detail. 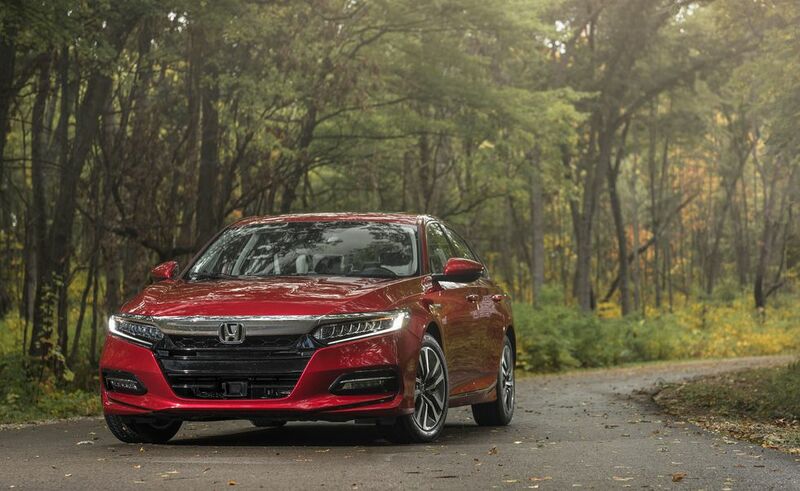 While agreeableness is a given in most new cars, the Accord’s dynamics are several degrees beyond the agreeable, with finely tuned primary controls, a light helm with good feedback, and an optional and precise six-speed manual shifter. The delicate, well-placed pedals work so naturally as to disappear. Likewise, the Accord’s controlled body motions and supple ride quality encourage its occupants to relax during the everyday slog. So how can it be so much fun to fling the Accord through challenging corners? We can imagine Honda’s engineers working late into the night, fretting over minutiae as their uneaten dinners grow cold at home. Their fine-tuning extends to the Accord hybrid, which joins the regular models on this year’s list. Its clever direct-drive gearbox and arrangement of motors and clutches help propel the car partially, or solely, on electrons, and the integration of all the pieces is seamless. 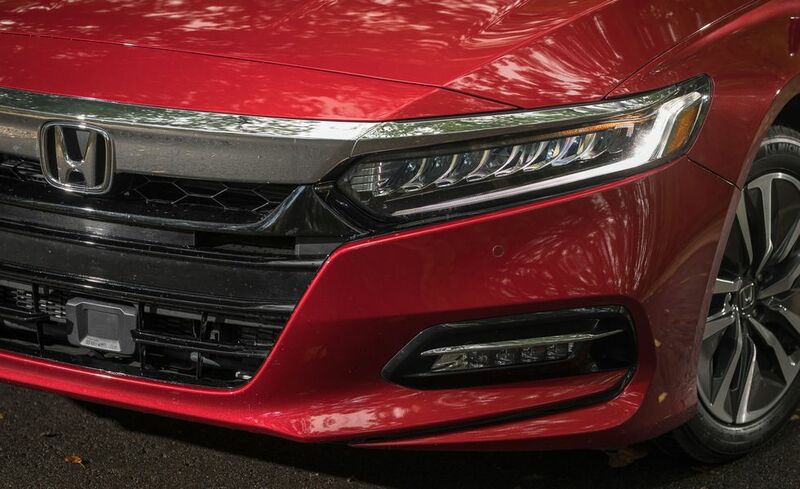 To the naked eye, the 2018 Honda Accord hybrid is a virtual doppelgänger of its standard-issue sibling. Aside from special wheels and a few subtle hybrid badges, there’s little outward evidence that a hybrid powertrain hides under this Accord’s sheetmetal. Five minutes behind the wheel, however, and its unique personality is evident. 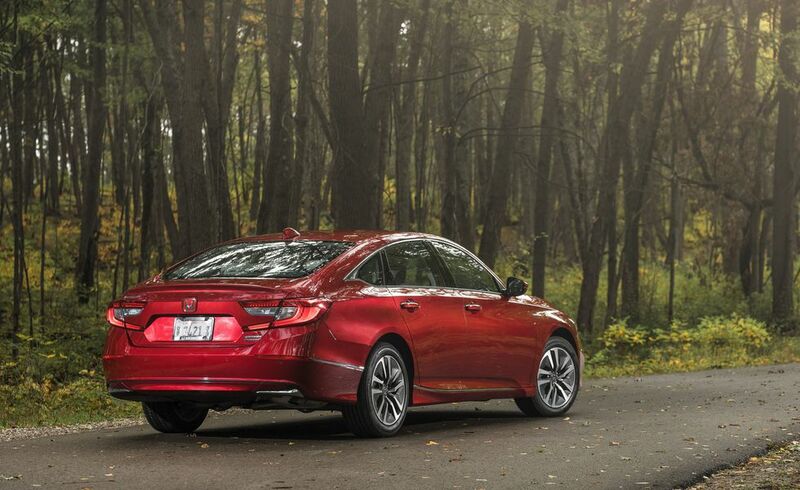 Like all current Accords, the hybrid impresses with its solid feel. Thanks to the added weight—our hybrid test car tipped the scales at 3404 pounds, some 250 pounds heavier than a manual Accord Sport 1.5T we recently tested—and the location of the battery pack and attendant hardware under the rear seat, the Accord hybrid displays a touch of that dense, stable sensation that in bygone days automakers touted as “road-hugging weight.” We were impressed with the hybrid’s quiet ride, an observation confirmed by its 69-decibel interior-noise level at 70 mph—matching our long-term 2018 Honda Accord 2.0T EX-L. And the hybrid shares the regular Accord’s supple, isolated ride over nearly every type of road surface. Most potholes pass underneath without undue disturbance, and larger imperfections are diminished by its rigid structure and refined suspension tuning. In its quest for maximum mpg, the hybrid wears low-rolling-resistance 225/50R-17 Michelin Energy Saver A/S all-season tires, and they’re not particularly grippy. Although the steering is reasonably direct and turn-in is snappy, the front end starts to push in even moderately aggressive cornering. The Accord hybrid registered just 0.83 g on our skidpad; that’s compared with 0.86 g for our long-term Accord and 0.90 g for the Accord Sport, a model that delights in such maneuvers. A cleverly configured drivetrain employs two electric motors and an Atkinson-cycle, port-injected, 2.0-liter inline-four engine making 143 horsepower and 129 lb-ft of torque. Total combined output is 212 horsepower. As we explained in our review of the mechanically similar, previous-generation 2017 Accord hybrid, this enables three distinct driving modes: an EV Drive mode using only battery power, a Hybrid Drive mode that uses electricity to propel the car with the gasoline engine powering the generator, and an Engine Drive mode employed under certain conditions that clutches the gasoline engine in at a fixed ratio. Although complex in concept, it’s simple in execution if a tad unrefined at the ragged edge. At the track, the Accord hybrid hustled to 60 mph in 7.1 seconds and cleared the quarter-mile in 15.5 seconds with a trap speed of 90 mph. Surprisingly quick given the slightly schizophrenic soundtrack, the Accord hybrid bettered the manual Accord Sport 1.5T’s zero-to-60-mph time by 0.1 second and matched its quarter-mile time. The 2.0T automatic Accord is the speed demon of the family; we reached 60 mph in just 5.7 seconds and posted a 14.3-second quarter-mile time in our long-termer. The Accord hybrid’s archrival, the Toyota Camry XLE hybrid, was a bit pokier in our testing, requiring 7.9 seconds to hit the 60-mph mark and 16.0 seconds flat to complete the quarter-mile. The Accord hybrid’s brakes are a mixed bag. While the pedal exhibits almost none of the inconsistent travel and erratic feel that formerly beset hybrids, the stopping performance could stand improvement. Coming to a halt from 70 mph required 189 feet but without a hint of fade over repeated attempts. The Accord Sport 1.5T did the same in a remarkably short 162 feet while our long-term 2.0T EX-L required 183; the Camry hybrid stopped in 180 feet. Before you chalk up the difference entirely to the Accord hybrid’s low-rolling-resistance rubber, consider that the last Kia Optima hybrid we tested stopped in 175 feet while wearing similarly efficiency-oriented Kumho Solus TA31 Eco tires. But it’s really efficiency that excites most hybrid buyers, whether in the form of savings at the pump or just for the sheer satisfaction of extracting as much energy as possible from a unit of fuel via the technical wizardry of a hybrid-drive system. As an indicator of how adept the Accord hybrid’s propulsion system is at applying the most efficient engine, motor, or engine/motor combination for the motive task at hand, consider that the 2018 Accord hybrid earns an EPA fuel-economy estimate of 47 mpg in all three metrics: city, highway, and combined. In typically enthusiastic Car and Driver testing, it returned 40 mpg overall, exactly matching our results with the Camry XLE hybrid. Both represent a substantial improvement over the 31 mpg we earned in the Kia Optima hybrid. In our real-world, 75-mph highway fuel-economy test, however, the Accord hybrid, at 42 mpg, fell short of the Camry hybrid’s 44 mpg. What this efficiency is worth is a subjective question. Our top Touring trim sported a sticker price of $35,605, nearly a $10K premium over the $26,670 total for the manual Accord Sport 1.5T. The hybrid Touring’s price, however, includes nearly every available option: leather-trimmed seats and steering wheel, premium 10-speaker audio, navigation, dual-zone automatic climate control, heated and ventilated front seats, heated rear seats, a power sunroof, a host of safety and driver-assistance systems, and about a dozen additional minor features. 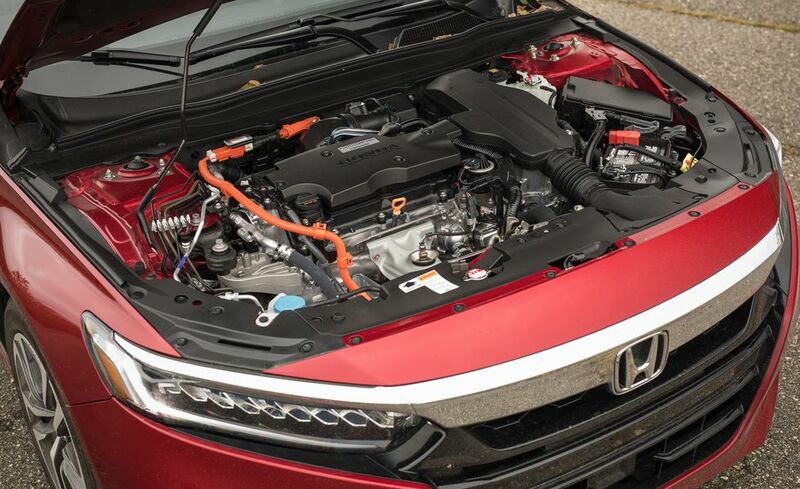 For 2018, Honda has expanded the hybrid powertrain across four trim levels—starting with the base sedan at $25,995, the EX at $29,785, the EX-L at $32,335, and finally the Touring tested here—so those less concerned with creature comforts can get their Accord hybrid for significantly less dough. A similarly equipped Camry XLE hybrid rings in at $37,245, which brings us back to some very familiar territory in the realm of mid-size sedans: Accord versus Camry. In the hybrid round, we’ll take the Honda. Human creations are rarely entirely perfect. Despite the Accord’s fastback profile, the slinkier Mazda 6 is still prettier. And none of us would complain if Honda obsessed over a better solution than the 10-speed automatic’s clumsy shift buttons. But the current-generation Accord, now in its sophomore year on this list, convincingly exhibits Honda’s obsessive-compulsive approach to mass-market carmaking. The model continues to balance engagement, quality, and practicality more consistently than any other car. This entry was posted in Awards & Accolades on March 21, 2019 by Administrator.